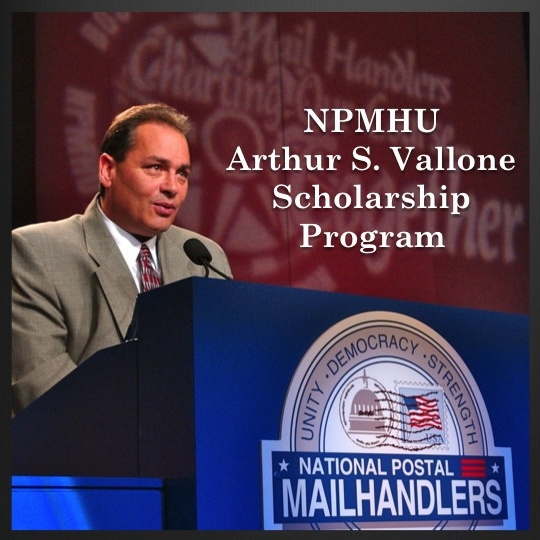 The purpose of the National Postal Mail Handlers Union Arthur S. Vallone Scholarship Program is to provide financial assistance to Mail Handlers and/or their family members who are seeking to further their education beyond high school. The program will award a minimum of 15 scholarships (3 per Region) in the annual amount of at least $1,000, renewable for up to four (4) years or until the completion of the undergraduate degree, whichever occurs first (for a maximum of $4,000 per recipient over 4 years). Additional scholarships may be awarded, depending upon the number of applicants and the number of renewals each year. Each year our Local makes available a one time $750.o0 Scholarship to children of Local 333 members beginning higher education in the fall. Please be sure to make your gift selection by completing a Notification of Retirement form and submitting it to your steward or by mail.